It's time for a new action packed Thimbleweed Park trailer to help celebrate that we're at Gamescom and we're going to be showing the game in the Indie MEGABOOTH at PAX West. It's time to meet everyone's favorite aspiring 80's game designer and heiress to the pillow factory fortune... Delores Edmund. Well done! How made this trailer? Eh... *Who* made this trailer? looking awesome!! I can't wait to play it. "Edmund" seems unusual as a last name. I'm curious as to where Delores's names come from. Delores, Doleres, Dolores ... arg! I'm sure we will get used to it too. The only thing which got my attention (uncanny-wise) was the pendulum right at the beginning (sprite rotation). Yes, sprite rotation – also seen at the bridge in the fireflies – gets me every time. Let's see if I get used to it. The jump in the game won't be as big as it appears in this trailer because here they sometimes only show small portions of rooms, scaled to the resolution of the video. Great trailer!! I am guessing that this one will get a lot of media attention. The short ghosts in the elevator clip reminds me of my recent family trip to Disney's Tower of Terror in California Adventure. Woo-hooo, the new trailer looks awesome! Can't wait! Thanks a lot for making such a game. I'm feeling excited like many years ago when I was a kid and red about a new game called Monkey Island in a computer game magazine and it took me several weeks to get a copy of this game and could play it. Now, today I can talk about these things since I backed this game here and got absolution. Looks beautiful, I'm really looking forward to this game! - do you know whether the iOS port will likely come out in the same/similar time frame as the PC/Mac/etc ones, or is it planned for later on? - relatedly, as a backer, would I be able to opt for the iOS version? Another awesome taster :) I'm really loving the style - smooth yet maintaining the retro elements. The puking scene really stays with me (in a good way). What a fireworks display! The game will be addictive! Just out of curiosity: Is Delores really used like that in the States? It's not the first time I've seen it and it looks really weird to me... the original name in spanish is Dolores. Delores, so hot right now. Delores. I think I like her voice. If there are only 80 people in this town, how can the phonebook have all those backers, which numbers go above 80? Is it because the phonebook is for the general area, that the town is in? I think so. Even in the circus are more than 80 attendees. It could be because TWP *used* to be a thriving city, and that's just an old phone book. Because even in Thimbleweed Park there are illegal immigrants. Trailer is the most exciting thing during development. Interestingly, there are some characters in the circus at 00:23 who remind me of certain characters from some classic adventure games I've played several years ago. There is even a green tentacle in the corner, which looks almost equal to a certain green tentacle from another certain game. I really hope that these similarities don't result in a legal issue. An orange tentacle with five suckers would also be nice. Or a Dr. Fred with a white face. Is that Garyand Ron in the middle row - all the way on the right side, perhaps sitting next to Gary with his 1987 hair? I meant David with his 1987 hair ! I agree with that. It's quasi his avatar. If I remember correctly, this is Ransome's flashback. And, Delores seems to be a bit smaller/younger. Therefore, the incidents from the flashback happened several years before '87. That's where David met Annie. He stole Zak's girlfriend, now known as Annie Fox. I spotted Sandy and Dave, Fred and Edna, Zak and Annie, a Caponian, Green Tentacle, Guybrush, David without a hat, Ron and Gary, Malcolm, Lauren, Jenn, Octavi, Robert. Thanks for noticing this! Paused at 00:23 and saw the tentacle! Isn't that Dr. Fred on the left, looking "pale"? Ah! I think, I know what you mean. He used to look blue in MM. So, he hasn't been only copied. By the way, at 01:00 we can see the tree from the "Design Dilemma" blog entry. =^_^= I love this. Dr. Fred, Edna, Dave, Zak, Annie, one Alien, Tentacle, ... lovely! And isn't that one guy the police man from Nepal's police station? Hey, is Stan there too?I miss him! The Edisons were bluish only in the 16-bit versions of Maniac Mansion. Since Ron defines the C64 version as the true one™, their faces should be indeed normal/rosy. Don't be so sure: This could just have been because of palette/sprite limitations of the C64. I think to remember that it wasn't really clear why/who changed their colour to cyan in the later versions, but if you look at this trailer: they are now greenish!? Maybe this was the intended colour. Or it's a compromise between pink and cyan. Or their army of lawyers told them the original colours are off-limits. However, I wonder why they used to look blue in MM. Were they supposed to be Zombies? "We wanted them to be odd and cyan was one of the few colors (C64 [-> EGA] Palette!) that looked OK. They sort of looks dead or creepy. Well, it was on the C64 and the PC where they were NOT cyan, but rosy! The C64 had a cyan color, so if they had wanted, they could have used it. Amiga and Atari editions changed that from rosy to cyan – LATER. I think this puzzle is already solved, Ron just had C64 <-> EGA mistaken in his post. They probably couldn't use cyan on C64 because of it's limitations (e.g. in Zak you get the last diving suit with transparent gloves [they couldn't use an additional colour for the hands/gloves] :-). In the end, it doesn’t really matter though. Now that ScummVM supports the C64 version in full, I’m satisfied and will play only this version. With the nicer skin color, in my opinion. You may be right that there weren't technical limitations, I'm also not a C64 developer. But they intentionally decided to use another skin colour in the later versions. And the reason it's cyan was because of the EGA colour palette but looking at TWP it wasn't a colour they really wanted. And since they didn't use pink either you should patch the actor colours in your C64 files to match that green and play the game how it really was supposed to be meant! Don't fight against it: green is the new pink/cyan! ...and in the back a little left is Jenn Sandercock, right? At least one girl there looks like her avatar. @Ron: Is every team member somewhere in this picture or elsewhere in the game? Didn't Maniac Mansion had an old clock and a staircase upon entering the house? Sorry, I'm an old 42 fart too excited to remember anything. "OK, this looks like the old mansion." It's pretty much the same, except there's no door between the clock and the staircase. Excellent!!! Incredible atmosphere, and Delores doesn't sound smartass as I expected. It's what I hated about Tales of MI, that Guybrush sounded a little annoying, it was not the clueless guy we loved in previous titles. That's because he became a real *beep*ing pirate! Thank you for this awesome new trailer! Finally the staircase are not "out of order" anymore! Ron is so young-looking... I don't know how its possible to see a reference from 1988. Simply I don't understand. Tell me my italian friend. The game is set in 1987. It's a fact. We already have determined that. So, how it's possible to see references of characters in the future, like Zak McKracken, Annie Larris and a representative of the future TPC? What you see it's not what it seems. Those characters does not come from the future! They are people of the Thimbleweed Town of 1987, dressed in an original way, just to seem cooler than other inhabitants! It is that other game, set in 1988, that took their characters from this one, set in 1987, because they looked so good!! Or they are movie stars as the trailer suggests and MM, Zak and MI were actually movies. But actors usually do not wear the same clothes/costumes as their roles when they are not on set filming. This was a very famous circus, people from all over the world (and beyond...) came to visit their crazy show! Note that this is a flashback so it's actually many years before 1987! David Fox said Zak plays in 1997 (you know that by heart, right?). Of course this doesn't mean they couldn't have visited a circus some time in their past (Zak and Annie sitting next to each other is of course coincidence, or fate). This only means Zak was relatively old in his game (he looks like a grown up in TWP + age of flashback (9..10 years) + 10 years -> this would mean he was ~40 years old in his game). Do we know that Zak McKracken is set in 1988? Is the time mentioned anywhere in the game game? What we know for sure is that the main story line of TWP is set in 1987. Maybe Zak and Annie found a time machine of an ancient alien civilization and traveled to the circus to see Ransome's act. The circus scene is from Ransome's flashback and Delores looks much younger, at least a couple of years. Dr. Fred and Edna sit next to Sandy and Dave. We do not know if this is before the kidnapping or after. If MM is also set in 1987 they have known each other before the kidnapping. Or it's just a coincidence. Maybe Dr. Fred got the idea of kidnapping Sandy when he first met her at the circus. But how does Guybrush fit into this timeline? If we only consider MI 1&2 canon, he could be the boy who lost his parents at Big Whoop, but a few years later. He obviously still loves amusement parks and circuses. My brain has been emptied by the Mindbenders™. No danger for me! "You guys are going to get a brain hemorrhage trying to make everything work logically. " Ron, David et al were at that Circus show several years before any adventure games. They met Dave, Zak, Guybrush and others there, and that's where they got their inspiration to do the games; based on real people! Games are fiction, but this scene is based on real events. Thimbleweed Park is just a convenient way to show where it all began. And yes, David stole Annie from Zak. Btw. according to Sandy the circus scene happened in 1977 or 1978. That explains why Ron looks so young in that scene. He probably lived in TP until he moved to SF. Did someone push the RED BUTTON at 01:02 ??? It seems so. Though, seeing the announcements, this time it won't be a dead end. Maybe it will be a key or a door this time. Nice! I hadn't thought to look for those. On my first replay, I thought I saw two on the same screen right away.. but they were ACTUAL pieces of dust on my monitor. But then I did find them in various places in the video. Very fun. But, according to the cleverness of the creators, puzzles involving codes, numbers, drawings are never the same every time the game is restarted. Even for the specks of dust, their position are random, whitin certain limits. I only just now looked over that code - thank you for the pointer! :) It looks like he calls the function "clampInWalkbox" with a random screen coordinate, so I assume that makes sure the dust will always be in an area reachable by the characters walking on the screen, so I guess the character you are controlling would walk over and pick it up like any item. (for some reason I imagined you would just click on it with the mouse and it would pop into your inventory - but that would pull you out of the game, which Ron has always argued against, like with hints). It also looks like perhaps the dust is replaced each time the room is re-entered (not sure about this), so the position would change in each room throughout the game, until it's picked up. Makes sense - like real dust, it isn't likely to stay in the same place. All my dust-spotting work for nothing, this is as frustrating as Sierra's "Dust Quest 3"! It might have been answered before, but is Delores a punny name not unlike Guybrush (guy.brush from DeLuxe Paint)? I'm thinking of the "lo-res" part of her name, as in Low Resolution where things get very... blocky. And is there a Dehires as well? There will be an option to change Delores in Dehires, but it affects the resolution of the whole game. This option reduces the resolution of the game to 178x100 except her character, making her look super awesome and HD! Who is doing the voice for Delores? I don't believe what I'm seeing, this is 1988 again. I'm so happy with this awesome game! Tonight is for read old Downbeat magazines and hear Damage Is Done by Konklins, youtube it. Game look amazing! It really feels like its 87, but still looks ridiculously good! Cant wait for my collectors edition, thank you for making this game! 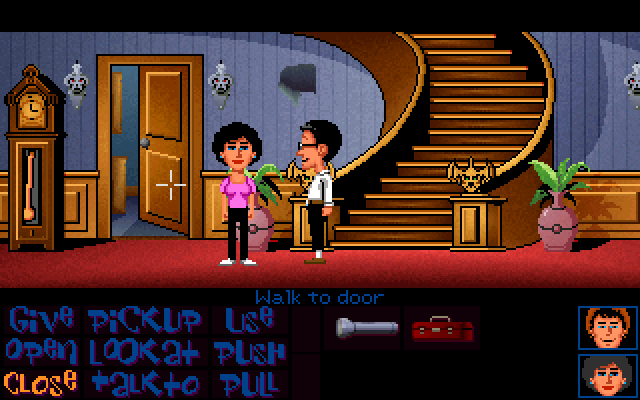 After this Maniac Mansion 3 with same graphical style, the kickstarter would EXPLODE! Who among us will be at Gamescom? I will bei at Gamescom on Saturday. Will bei wearing a gamescom t-shirt with "MarkB2000" on the back side. Will check out XBOX stand first. Will you go to adventure-treff party on Friday? unfortunately I couldn't be there, no tickets found and it's too late now. Glad to read that you are one of them! Well you can still go there, stand in front of the entrance, weep, and then visit the Adventure Treff Party. Man this game looks great! I am so excited to play it. I also love the font used in the video. I actually like it better than what is used in the banner at the top of this page. It's modern, but the wood design makes it look a bit old-fashioned. I hope this will be the font for the box design. Yikes. Not only puking, firebreathing that looks like fire-puking. Best-game-ever!! Standing in front of your booth at gamescom right now. Waiting time is approx. 1 hour to get in. But why is it in the 18+ section? 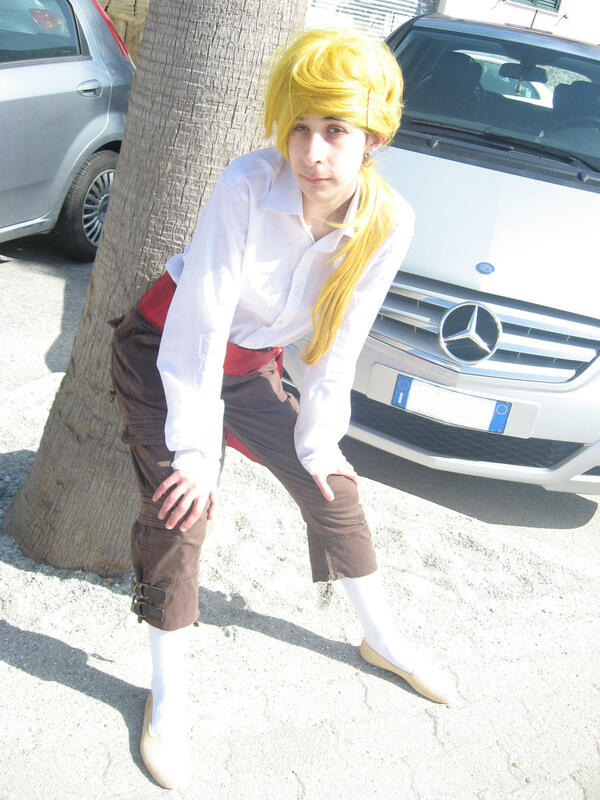 You do not know how cool it is to see guybrush MM style. I'm making plans and 5 of the things in it are just to play this game. It is the largest consumer show dedicated to Italian gaming world, promoted by the Association of the video game category, and organized by Fandango Club. 32,000 sqm of game with national premieres, tournaments, retrogaming, cosplay, indie area and junior area. ... any chance to see Thimbleweed Park demo there? Now where is my time machine to jump to early 2017..
Never have I experienced before, the anticipation of future nostalgia! 00:42 I like that computer and that display! Is that waving effect always happening while playing as the ghost? where exactly / hall can i find Robert Magone on gamescom? thx. i am on my way now. hopefully i will enter hall 8 at 15:00 German time. take my 6 year old son with me. he cant wait to play it. already played MM, Zak and MI 1+2. He is hooked. Wow, a 6yo boy who played MM, Zak, MI 1+2? With a little help from me of course. Too bad it was in the 18+ section (but you know, fire-puking and stuff :-). Btw. : Did you ask why? I wonder if it was because of smoking, or just a problem with exhibition space. They had several xbox stations at the booth. Waited approx. 30 mins in line to enter it. And that was even the shortest line i saw. Only 1 xbox with TP on it. At least when i was in there. I think robert and his friend spectated me, haha. But i recognized them when i just was leaving. So the other stations had several different games +18 on it. I told the xbox guy at the entry that my son only would spot TP and doesnt care for other games. But the rules you know, german correctness. Cant blame them. Is as it is. So i went in alone and grabbed the pad. Knowing that family waits outside it was mich more stress than fun for me to observe the game. Just checked verbs, scrolling behavior and items. For this kind of game it is lame to play it in a hurry. Even if its a demo. And i dont wanted to destroy my virgin/pure feelings for the game. PS. I played in english. Not german. That was quite some wait time just for storming in and out. But at least you got same swag for your son! I too wouldn't want to really play it until it's done. It's hard to believe that a whole year has passed since Ron's attendance at Gamescom 2015. I know you've been pouring a lot into this game...and it already looks so incredible...I'm just curious, will you please make another game after this?!! I think, it depends on the selling of the final game only. We therefore must not pirate TP by any means! I look forward to play the game. I will buy it for Linux and or Android. I really wait for it. One thing that I already seen in the trailers doesn't like me too much. It's a bit confusing. Are road signs part of the population? Maybe add another shoot sound (the successful one)? The poor guy was hit by that single bullet either before it hit the sign or after the sign, or it was him who shot in defense and then had his head bitten off by SPOILER. Specks of dust got him. I reckon that's the big twist of the game... at the end it turns out that it was all down to the Dust Monster™ that you had unwittingly been putting together in your pocket the whole time. What i saw today at gamescom was impressive. I think the joypad functions work very well and do the job. Very fast verb selection with the rear buttons.I wont play it on xbox. PC with Mouse will be my machine. But congratulation for the port adaption. While pushing left stick and moving it, the characters moved where i moved the cross. But why the hell couldnt i give the polaroid film to ray? Tried it several times. Hadnt much time to play and u can believe me i would have played as long until they would have thrown me out of there. My Family was outside waiting. My son cried coz they couldnt let him in to see it. The xbox next to TP was sniper elite and so my 6 year old son had to stay outside and did cry though. But Robert gave me some nice items and gifts. So all is good. What else can i say? I am a backer as the most of us here and i still can wait until it's release. Lucky man, and a consolation prize for your little boy! It is the game, as we all see it here and it will be as we want it to be. Ahhhh as the devs want it to be. It will meet our requirements and will bring us back to our youth. Lol. We all will get what we like and its worth the wait. No dissapointments, this i can guarantee you. PS. The Characters move fast and smoothy. The Character called Teddy is my favorite. Looks like zak with googlenose. Thimbleweed Park will be what the classic Lucasfilm Games used to be. Mission accomplished. I’m sure you know that this would not have brought back the style presented on the Kickstarter page. I really wonder why there seem to be people who don't agree with the different style. I, personally, don't miss the EGA style from the Kickstarter page at all. I like Mark Ferrari's contribution to TP as well as I like his contribution to Monkey Island. We ought to be deeply grateful for the art style in TP. I do miss them a little bit. It's most likely a nostalgic thing I guess. But those colorful images with shadows etc. look great to me! Eheh, nostalgia... that's the Zak McKracken version I prefer. I wonder why you wonder; this is called “personal taste”, not “truth”. No need to be offended. I didn't intend to make you feel offended. Sorry, if it looked that way! In principle, I would have liked the style from the Kickstarter page, too, and I think that it would have demonstrated wonderfully that the story, the characters and the puzzles are what characterizes a good adventure game most, rather than the graphics. Though, I think that Mark Ferrari's more sophisticated art style makes the game more epic and immersive. Maybe I also like it because I began to play adventure games not until the 90s, when Zak and MM were already a bit outmoded. In my opinion, the early 90s have been the May of this genre. By the way, we have never seen this "pixel purity" mode yet, have we? I'm curious about it. Maybe the pixel purists mode hasn't been implemented yet. Ron stated that it would look crappy. He doesn't seem to like it. But, it would look more classic, of course. Honestly, I like how Guybrush's sprite gets downsized coarsely whenever he strides away. Of course, he looks strange when his height is only 15 pixels, but this was state of the art back then. Well, seeing that Ron prefers smooth scaling, he could actually experiment with smoother pixel-true low-res character scaling via anti-aliasing, which wasn't available back then. As an option, of course. I liked the more simplistic art from the Kickstarter and I also like EGA graphics with its 16 colour palette in games like MM, Zak, Loom. The thing is: the artists hate it, they always have. Although I would have slightly preferred the original vision, the current style (looking more like the VGA versions of such games) is also great. It's also more suitable for a larger audience which is good thing if it means more adventure games from Terrible Toybox will be created! I'm more the point'n'click guy (I also have a touchscreen for "coop" play), but it will be interesting to try all the controller schemes for the game! It will probably take about a week trying out all the game options and control options. I'm probably going to use Xbox controller on the PC version. The original Maniac Mansion was joystick only on the C64, so this makes it that much more faithful. Plus, the real reason is that I can kick back a little more and lay on a couch while playing comfortably. I will definitely try them all: controllers, mouse/keyboard, touchscreen(/keyboard) and then let's see. Yes, I remeber when in Maniac Mansion on C64, I was in the dungeon, searching for a way to escape... I was repeating myself "There MUST be a way, there MUST be a way to escape...", so I clicked the "What Is" verb and, with saint patience, moved the cursor with the joystick, one pixel row at a time... until the "loose brick" appeared!!! And I shouted: "Yes!!!" A friend showed me that brick, I don't know if I would have found it on my own! This was slightly easier than using the mouse. I have to admit that I found the brick and the books only after suggestion. But I don't blame it: it was part of the way to solve such a game back then. No walkthoughs available on the internet, no pics posted by someon with the indication: "click here". And you start pixel hunting with faith, hoping that was not simply a legend. Because legends arose on these games.... I spent months on the edge of the cliff of the third trial in Indy3. Everybody between my friends was sure it was a matter of pixel hunting. To pass, you have to click on a precise spot. God knows if I have tried every single pixel. Then somebody suggested me the supposed "right spot". I went in the room, clicked there, and ta-da! It worked. There were a lot of rumors about those game back then, e.g. kids imagined stories about areas in games behind closed doors which you actually cannot go through etc. (for instance the stairs in Maniac Mansion). I went there with a friend so see (and play) the game. First of all, the booth itself was in the last corner of the hall; inside was only one single console built up. When we entered, all other consoles were in use, just not Thimbleweed Park. (Our luck!) Still, these surroundings were bad advertisement for this game. We didn’t see Robert (Friday, about 3pm). So no items for us. The visit as such was a bit disappointing, to be honest. Why I write this as a reply to you? Because of your question about the Polaroid film. My friend had the same issue. When he handed the controller over to me, I could do it instantly. The reaseon was that he, being a PC player, didn’t know that A is the normal “click” button. He used “X” for that, which takes the “favorite” action. This worked very well for most of the time – except for the Polaroid film, where “look at” was chosen when used with X. Maybe this is also the reason why it didn’t work for you…? About waiting and crying children: To put Thimbleweed Park in an “18 above” booth is… well, see paragraph 1. You are on a very good way regarding the game. The presentation was not so lucky. great. thx for the info. i dont own a xbox, so yes this was the problem. just used the X.
and putting TP into the +18 section...well for a "PG 13 or below that game" the choice for that location was kinda lame. so even age 16 was forbidden and they couldnt watch it. but maybe they put it in there, to limit the viewers with only 1 TP xbox console. My guess is that Microsoft put all “not-so-important” games into this booth. The other locations showed only one game each, in this booth there were six or more different games. What say.. TP is AWESOME!! I run on the monitor with TP but Robert wasn't there. Another guy show me the game and give me A LOT of merch. Play with controller is good. Very easy and fast. I didn't believe in pad for an adventure game but it works. Btw i'll play with mouse and keyboard :D.
The thing more impressive for me was the 16/9 graphics for an adventure.. i play from 1990 (my first game was monkey island that i still play like other adventures). It's a very strange sensation to see what you always saw in 320x200 or 640x480 in the glory of 1920x1080. I can't explain but i really liked it!! i appreciated lot of new things (vs. monkey island) in the game.. I can't say nothing more.. just it's hard to wait now!! Thx to all TP for existing!!! And you were allowed to stay unless somebody else would have wanted to play themselves? Really? We had to leave with all the others. I just can say - Awsome! Just a few minutes but what I saw was just awsome. I can´t wait for it. So much detail and hidden fun and references to other games. The audience at the circus - just great. Walking back an forward in the circus trailer- it leans a bit! Fantastic work and ideas. Its much more than expected. It looks fantastic on a big screen und playing with a pad works too. But I will of course play with a mouse. Now I´m much more excited. Did I say I CAN´T WAIT FOR IT??? I Love you! Really! That´s weird, but I have to say it. Tim, why you played only a few minutes? What's happened? I was in Gamescon on thursday.. maybe less ppl and more time to try it. Btw no one disturb me while i finish the demo.. i think approximately 15 minutes or less. When i finish that the guy give me merch and noone from microsoft tell me to leave.. I stop at MONSTER BOY monitor but was occupied so i leave by myself. indeed the room was very hidden.. i had to spoke with microsoft ppl to ask where was! Thimbleweed Park was presented was in a nearly hidden secret room, In the hughe Microsoft Booth. I had really to search it at first. There where several games shown together and a bunch of peaople could get in every time the opened the "Door". I had to wait until the door opened again but they stopped me and two guys in front of my and closed the door again. It was really fun seeing it and I was just looking at the game and could barely hear what he was talking about. But I think he was really into the details too, but his audience was more like "whoa look at this and this, isn´t it funny" but did not see the real funny and hidden stuff. He was talking about some blinking lights and details about them, but nobody of them was listening or understanding his effort really I think. I grabbed a Thimbelweed Button (Ok, three) and went out crying. Ok, without crying but I was really sad I could not play more by myself. I shot a few fotos with my cellphone (including the presenter) but I don´t know if it´s ok to show them. I´m sorry for the typos, had to answer 15 calls (!) in between, I´m at work. Eheh, you are an hero! Since it was a public demo, I think there is no problem in showing your photos. you seen my pics on twitter, right? Yes, I did. The one with a left ear, left glass, yellow t-shirt and agent Ray looking at the dead body bloated and pixelated from a death come too soon, on the background! I was showing this to someone when I noticed a glitch at 0:32. The plants in the closest-to-the-camera layer seem cut off, as if they belong to the edge of the screen but were accidentally placed in the middle. The gardener had to call it a day! He will resume trimming the plants after the weekend.